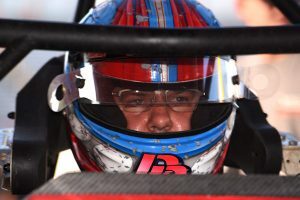 Dietrich, certainly no stranger to the Pigeon Hills, finished sixth during feature action on Saturday night, the result of a rally from 15th on the grid. In addition, the 25-lap main event went green to checkered; no cautions and completed in just over six minutes. Danny Dietrich and Gary Kauffman Racing will join the Arctic Cat All Star Circuit of Champions presented by Mobil 1 during all four of their scheduled appearances in Central Pennsylvania during the upcoming weekend, first visiting the always-exciting Grandview Speedway in Bechtelsville on Thursday, August 23. All Star action will resume with the Jack Gunn Memorial at Williams Grove Speedway on Friday, August 24, followed by stops at Lincoln Speedway on Saturday, August 25, and BAPS Motor Speedway on Sunday, August 26. Certainly one of the highlights of the weekend, the Williams Grove Speedway visit will feature twin, 20-lap features, each awarding a $4,000 top prize. 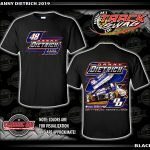 A heavy, local favorite for the weekend, Dietrich will enter the four-race, All Star swing with nine victories on the season, seven of which accumulated during starts at Lincoln Speedway, Williams Grove Speedway and BAPS Motor Speedway. 2018 Highlights: Earned three top-ten finishes against the Arctic Cat All Star Circuit of Champions presented by Mobil 1 during trip to Florida in early February, all highlighted with a seventh place finish at Volusia (Fla.) Speedway Park. Earned win at Lincoln Speedway on 3/10 worth $3,500. Finished second at Lincoln Speedway during Sprint Spring Championship ($5,000). Earned pair of seventh place finishes at Williams Grove Speedway and Port Royal Speedway on April 6-7. Picked up second win of 2018 at BAPS Motor Speedway on Sunday, April 8. Finished third with All Star Circuit of Champions at Williams Grove Speedway on Friday, April 13. Finished eighth at Williams Grove Speedway on Friday, April 20. Earned third victory of season on Saturday, April 21, at Lincoln Speedway. Rallied from 12th to finish sixth during Sprint Car World Championship at Mansfield Motor Speedway on Saturday, April 28. Finished fifth during World Championship preliminary feature on Friday, April 27. Earned runner-up performance at Williams Grove Speedway on May 4. Earned fourth win of season on Saturday, May 5, at Port Royal Speedway. Finished second during WoO Tuneup at Williams Grove Speedway on May 11. Finished sixth during Bob Weikert Memorial finale ($10,000-to-win) at Port Royal Speedway. Earned first Williams Grove Speedway victory of the season on Friday, June 1. Earned four consecutive top-ten finishes from June 7-10, three of which during All Star Circuit of Champions competition in New York. Highlighted Ohio Sprint Speedweek with three top-ten finishes, one being a third place finish at Sharon Speedway on June 19. Earned three victories during PA Sprint Speedweek; two at Lincoln Speedway and one at Port Royal Speedway. Earned a combined seven top-ten finishes during PA Sprint Speedweek. Earned ninth victory of season from 11th during Lincoln Speedway make-up feature on Saturday, July 14. Finished second during Port Royal Speedway’s Living Legends Dream Race ($10,000) on Saturday, July 28. Finished third during Mansfield’s Great Lakes Dirt Nationals on August 11. Finished sixth at Lincoln Speedway during non-stop 25-lap feature on August 18.